Heat a skillet over medium heat. Toast walnuts in skillet until fragrant and lightly browned, 3 to 5 minutes. 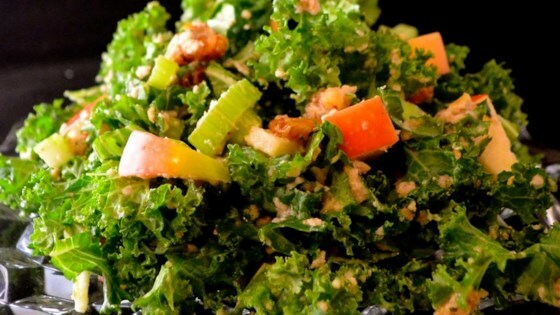 Toss kale, celery, 1/2 of the apple, 1/4 cup walnuts, and 1/4 cup raisins together in a large bowl. Combine remaining apple, walnuts, and raisins with Dijon mustard, water, red wine vinegar, and sea salt in a blender; blend until smooth, adding water as needed to thin the mixture so it blends completely. Drizzle dressing over the salad and toss. Transform a slightly bitter green into something truly delicious. Fantastic quick recipe! Dressing is delish! I made it just as the recipe states (includingadditional water). We liked it very much and will make again. Thx for sharing.